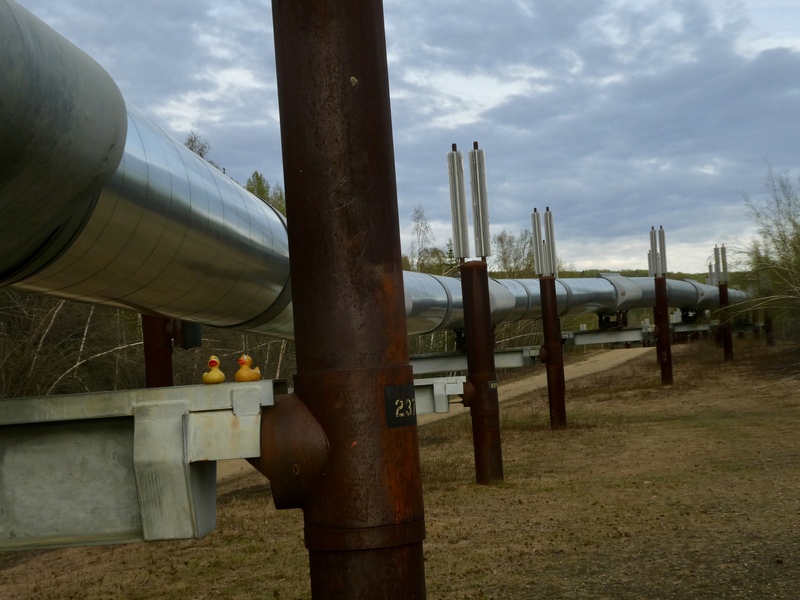 Today Eider Duck wants to show us the famous Alaska Pipeline. Remember, Eider lived with his dad in North Pole, Alaska, near Fairbanks. He knows what the tourists wanted to see. 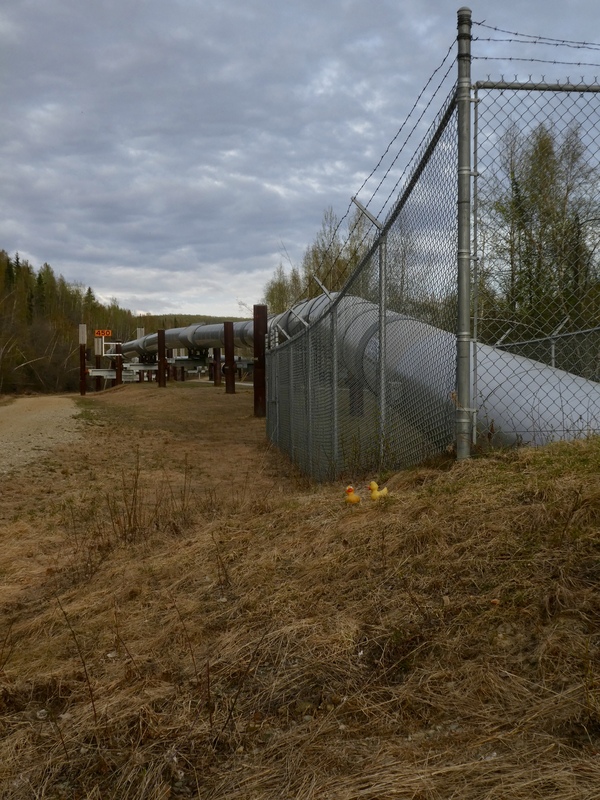 A few miles north of Fairbanks, at Fox, Alaska, we can see and touch the pipeline. 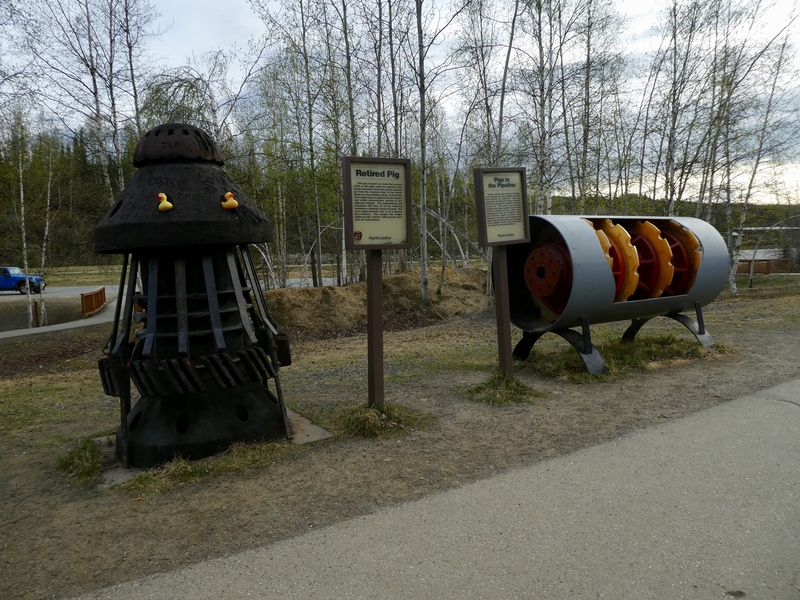 But first, a little about the famous Alaska Pipeline. 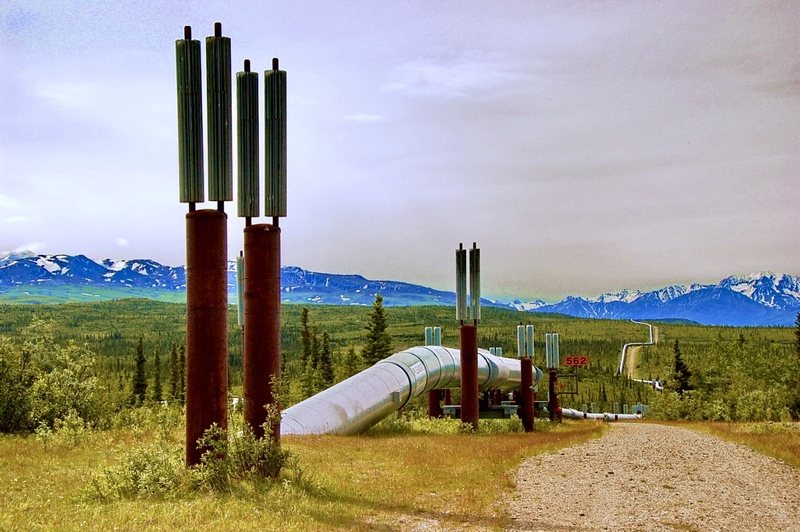 The real name is Trans-Alaska Pipeline System (TAPS). 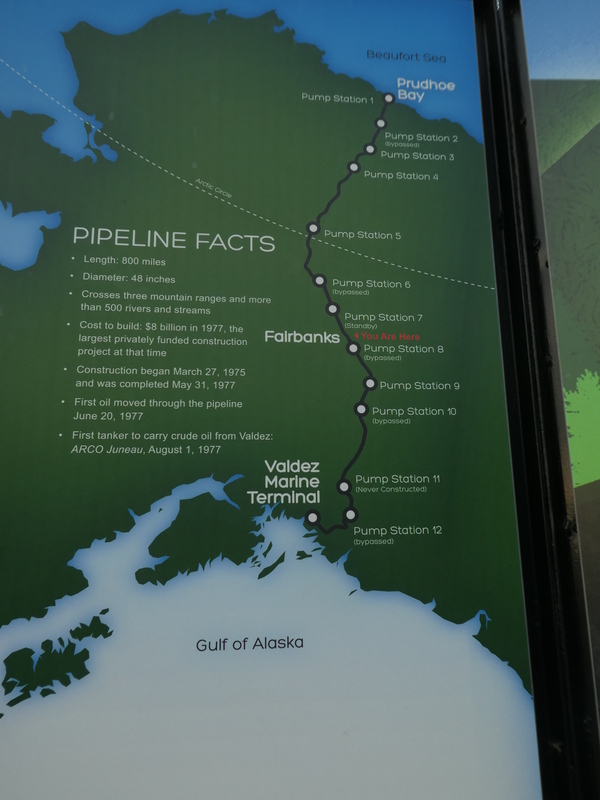 The pipeline was built to transport oil from the Prudhoe Bay oil fields, north of Arctic Circle and near the Arctic Ocean, to the ice free port of Valdez. This was a very big engineering accomplishment in the 1970’s. While this looks like the pipeline is rather low to the round, it isn’t. Mom could hardly reach this ledge for us to sit. This pipeline is 800 miles (1300 km) long. An average of 1.5 million barrels of oil are transported through the pipeline every day. It takes 11.9 days to reach Valdez. The oil travels at 3.7 miles per hour (6 kilometers per hour). There is a constant need to clean the inside of the pipe. 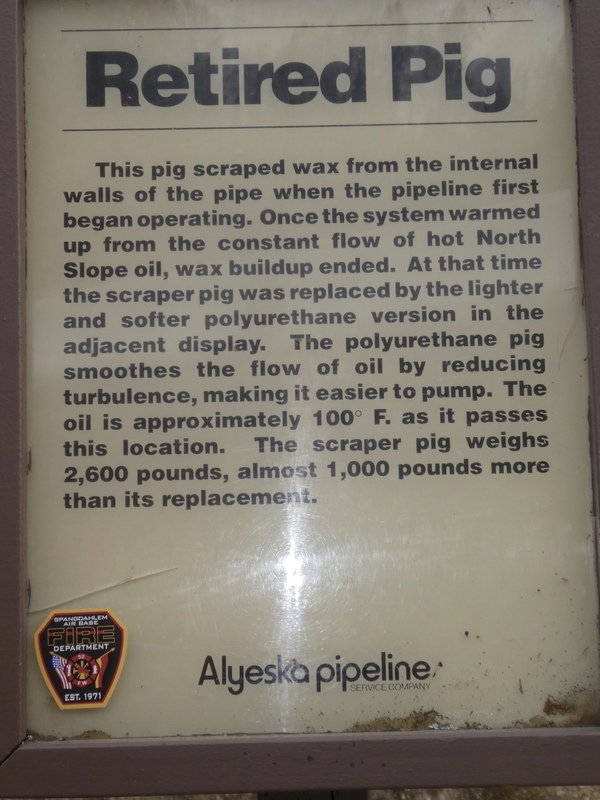 Items, called pigs, are put in the pipeline at Prudhoe Bay, for cleaning and other maintenance reasons. Let’s look at the original and the current pigs. They have made changes since 1977. The pipeline is elevated to protect the frozen ground. Oil from the ground enters the pipeline at 120 degrees F (49C). The oil cools to 111 degrees (44C) while traveling through the pipeline. Permanently frozen ground is called permafrost. If this permafrost thaws, the ground becomes unstable. This is not good. The pipe is insulated to keep the ground cold and release the heat into the air. Also, moose, caribou, and reindeer migrate through much of northern Alaska. These large animals must be able to walk under the pipeline. An Alaskan moose is often 6 feet tall. Sometimes the pipeline is underground. Here we can see the underground pipe breaking through the earth’s surface and continuing above ground. When the pipeline is above ground, it has a zig zag pattern. This zig zag layout allows for movement in the line, caused by heat, weather conditions and earthquakes. This part of the Alaska Pipeline is south of Delta Junction, about 120 miles from Valdez. Pipeline Photo from internet free photos. From the hill, you can see the zig zag pattern of the pipeline, heading toward the mountains. Before building the pipeline, a 360 mile road from the Yukon River to Prudhoe Bay, needed to be built. This road is used by excellent truck drivers, all year, to carry supplies to the people working in Prudhoe Bay. The frozen area, north of the Arctic Circle, is difficult for construction. The frigid winter temperatures, ice, wind, and snow, make living and driving conditions very difficult. We, the Colorado Traveling Ducks and humans are in awe of those that built, maintain and work in these conditions.